GEN. FLOWERS: Good afternoon, and welcome to the Air Force budget rollout for FY '11. Our budget development follows the over-arching DOD strategy guidance of prevailing, preventing, preparing and preserving, while continuing taking care of people, rebalancing the force, reforming acquisition and supporting the joint team. 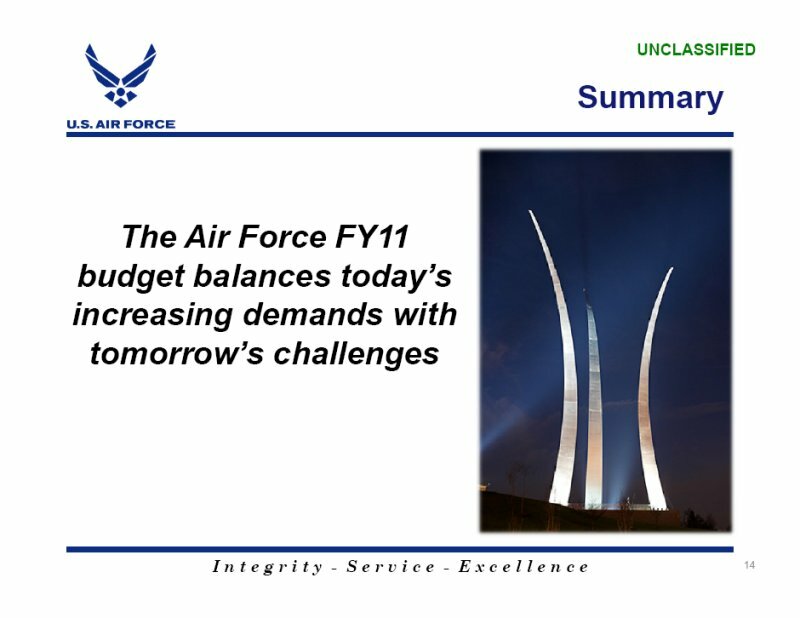 The next slide focuses on our Air Force priorities. Next, please. Over the last two years, we've worked hard to strengthen the nuclear enterprise. The budget continues ensuring the enterprise is safe, secure and reliable. We continue partnering with the joint and coalition team to win today's fight; remain focused on our greatest asset -- airmen, families and our civilian workforce; continue to modernize as we organize and train and balance across core functions. To the full range of demands, we must excel as stewards of taxpayer resources. Therefore, we continue to aggressively press ahead with our effort to recapture acquisition excellence. 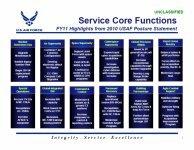 This chart highlights our 12 service core functions which describe the unique capabilities available to the national command authority and combatant commanders. 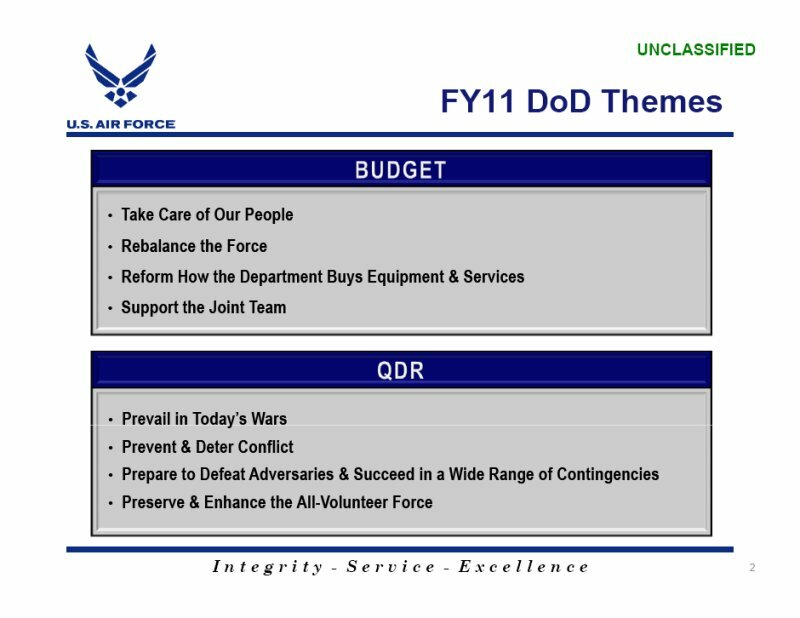 In the -- in the budget request, we prepared a balanced portfolio of capabilities across core functions. These core functions in support of Air Force priorities are the basis for developing our performance-based budget. While we align resources to strategies using core functions, our budget rollout brief is best understood when discussed by appropriation. This chart represents the total Air Force budget, to include overseas contingency operations, the non-blue part of the budget, which includes defense health, special operations and intelligence programs. 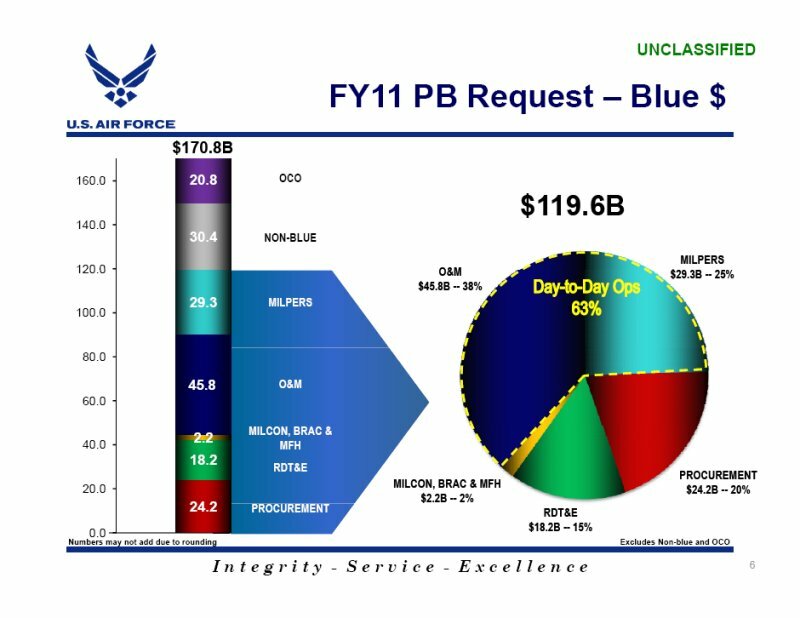 The focus for today's brief is the Air Force blue baseline portion and the overseas contingency operations piece. Before we proceed to the major highlights of our appropriation, let me draw your attention to two major deltas in O&M and Procurement. The $3.6 billion increase in O&M -- the key drivers for the deltas are $2.1 billion (dollars) in price and inflation increases, consisting of $1 billion for fuel price increases -- fuel prices increased from $118 a barrel to $127 a barrel -- and $1.1 billion (dollars) for other inflation across the O&M portfolio, which includes the civ-pay raise of 1.4 percent. Another billion-and-a-half-(dollar) increase is for joint basing. Additional civilian end strengths makes up about $400 million (dollars) of it. Communications-related activities were about $300 million (dollars). And U.S. Cyber Command $100 million (dollars). Our RDT&E delta represents programs moving from development to procurement, such as the F-35 and the B-2 radar modernization programs. 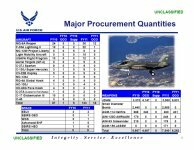 The procurement delta of a-billion-and-a-half dollars plus -- the major drivers are increased procurement for F-35s, MQ-9 Reapers and light-mobility aircraft. From this point forward, this briefing is geared towards our blue baseline Air Force appropriations and overseas contingency operations. 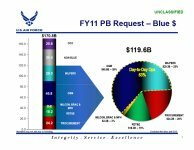 As previously mentioned, the blue baseline does not include Defense Health, Special Operations, intel and overseas contingency operations. I'd like to draw your attention to the fact that 63 percent of our budget supports day-to-day operations or requirements such as military pay, civilian pay, flying hours and daily upkeep of facilities and base support. Procurement represents 20 percent of the total budget. 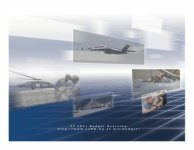 In the procurement appropriation, 20 percent funds modifications and upgrades to legacy systems, which allow us to meet today's warfighter demands. Our DT&E is 15 percent of the total budget, allowing us to invest in new and emerging technologies for future warfighter requirements. Our total force end strength is 510,100 personnel, and funds pay allowances and entitlements. The active-duty end strength is 332,200 in this budget and represents an increase of 662 personnel for ISR demands in FY '11 -- increased ISR demands. 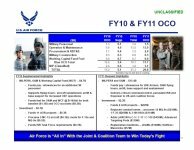 FY '11 continues rebalancing the skill set to cross Air Force core functions while supporting increased warfighter demands in ISR, information warfare and command and control. ISR capabilities increase to 50 combat air patrols by the end of FY '11 and 65 by the end of FY '13. 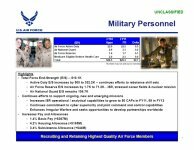 The Air Force Reserve end strength of 71,200 personnel represents an increase of 1,700 personnel for ISR, which is 896 people, stressed career fields, 297, and the nuclear mission, 70. The Guard end strength remains constant at 106,700 personnel. We continue to take care of our airmen and families with increased pay and allowances, such as the 1.4 percent increase in base pay, 3.4 percent in subsistence and 4.2 percent in housing. O&M is the bread and butter for day-to-day operations in this budget. 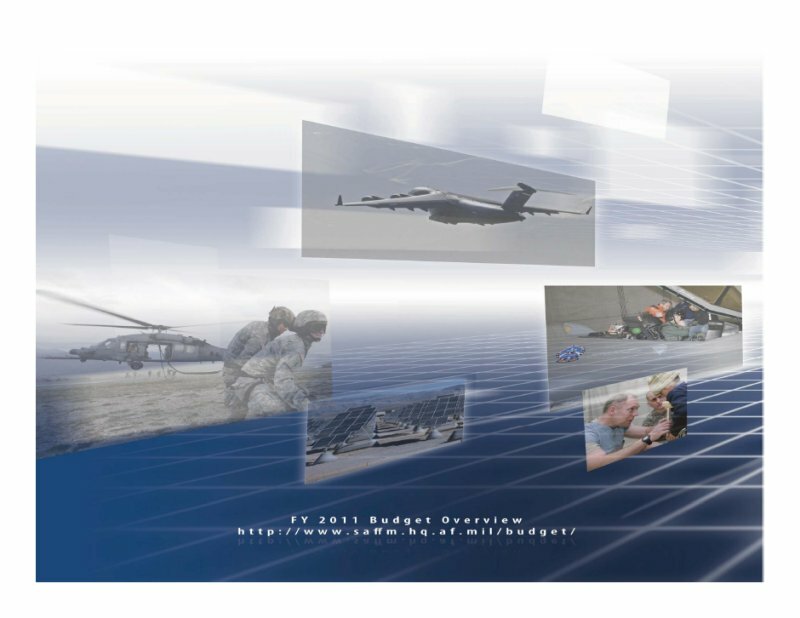 O&M is the -- in this budget, is -- focuses on new and emerging requirements as well as ongoing missions. Focuses on increased demand for ISR and builds on progress we will make in FY '10 to increase to 50 combat air patrols by the end of '11 and 65 by the end of '13. 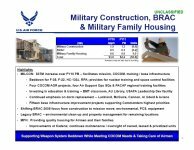 It continues implementation of BRAC joint basing decisions, where the Air Force is lead in six of 12 bases. They are McGuire, Andrews, Charleston, Elmendorf, Lackland, Randolph, and Langley. We've optimized a flying-hour program to reflect historical peacetime and contingency execution, funding 1.2 million flying hours fully in this budget. Weapons system sustainment funding preserves combat -- COCOM support, Air Force priorities, and sustains a fleet of 5,500 aircraft as well as the space and nuclear enterprises. This budget also supports a total of 24 space launches in FY '11. It takes care of our civilian workforce with a civilian pay raise of 1.4 percent, consistent with that of the military; continues contractor-to-civilian conversions. We are in-sourcing from contractor to civilian 7,726 positions in this budget. It supports operations of 80 major installations and includes (one) billion dollars for support of Air Force families, such as child care centers, spouse support and quality of life activities. The military construction appropriation in FY '11 is $37 million over what we asked for the FY '10, representing a 2.8 percent increase. The 2009 American Recovery and Reinvestment Act assisted in addressing some of our most critical projects. This budget aligns completion of nuclear construction project -- projects with weapons system deliveries. It supports the F-22 projects at Elmendorf, Hill and Langley, and F-35 projects at Eglin and Nellis. We've made significant investments in dorm replacements at Lackland, McGuire, Cannon, Aviano and Al Udeid. It funds the basic military training and recruit housing and training complex, number three, at Lackland Air Force Base. It funds an Air University library upgrade at Maxwell Air Force Base and an Air Force Academy leadership facility out at the academy. It continues housing privatization. We have 53 hundred -- 53,000 houses, family quarters, in the CONUS. By the end of FY '10, 39,000 of the 53,000 will be privatized, or 73 percent, and the goal of a hundred percent by the end of '11. It continues support for airmen and families, and meeting COCOM demands. In BRAC, the current round of BRAC is moving to completion and is on schedule. 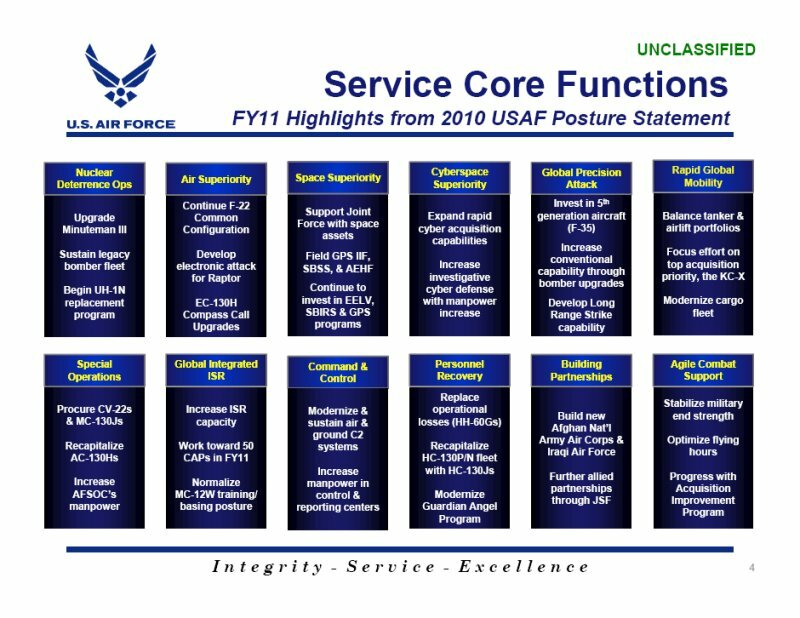 In FY '11, we'll complete all moves and fund PCSs, equipment and training. Legacy BRAC remains about a $130 million a year requirement for cleanup and other caretaker responsibilities at 28 remaining locations. The family housing program continues to decrease as we move towards 100 percent privatization of CONUS housing. 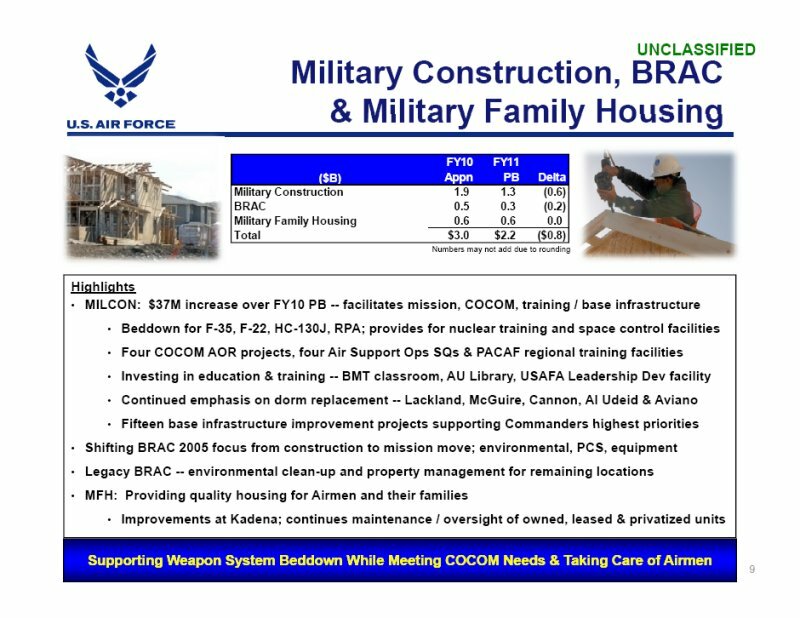 We are continuing to improve family housing at Kadena, with a $74 million renovation and upgrade to more than 400 units in this budget. The RDT&E decrease reflects programs moving from development to procurement. And let me highlight a few of the programmatic changes in this budget. Our number-one priority in acquisition is the KC-X tanker replacement. We are planning to release the Request for Proposal in the second quarter of this fiscal year, with a summer 2010 contract award. We have invested in critical technologies and concept exploration for a long-range strike platform. Science and technology is funded at $2.2 billion, or 12 percent of the R&D budget. This budget ensures capability of legacy fighters with F-15 radar upgrade and F-16 fatigue study tests. 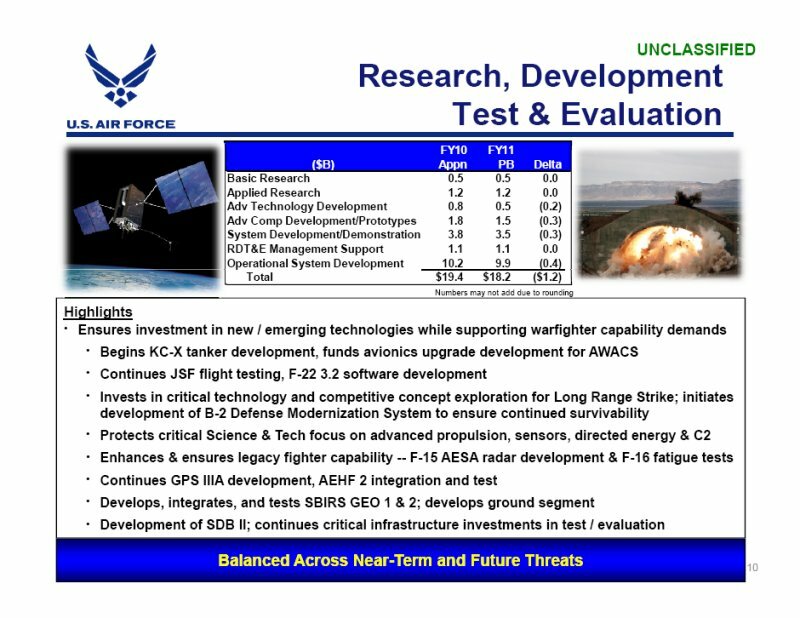 It continues GPS-3A development, provides for AEHF-2 integration and testing, develops, integrates and tests SBIRS GEO 1 and 2; and RDT&E is balanced across near- term and future threats. In procurement, we continue meeting today's warfighter demands while posturing for the future. In aircraft procurement, we plan to purchase 97 manned and 52 unmanned aircraft, for a total of 149. In the ISR portfolio, we procure 36 MQ-9 Reapers and four Global Hawks. We continue investing in fifth-generation fighters with procurement of 22 F-35s and advanced procurement for continued production. Mobility procurements include eight C-130Js, nine HC/MC-130Js, eight C-27s, 15 light-attack mobility aircraft. And in Special Ops we procure five CV-22s. We upgrade critical mobility assets as well, with 10 C-5 upgrades for avionics, and six C-130 avionic upgrades. We do reliability and re-engine on seven C-5s -- reliability enhancement and re-engining for seven C-5s. 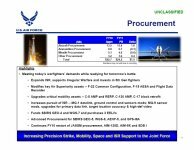 In the space portfolio, procurements include SBIRS Satellite 4 and long lead for SBIRS Satellite 5, Wideband Global SATCOM Satellite 7 and advanced procurement for Satellite 8. In munitions, we continue JASSM procurement from the FY '10 start, and purchase 171 pods in the (FY) '11 budget, as well as small- diameter bombs, AIM-9s and AMRAAMs. Our efforts in major procurement rebalances today's fight, while posturing for the future. 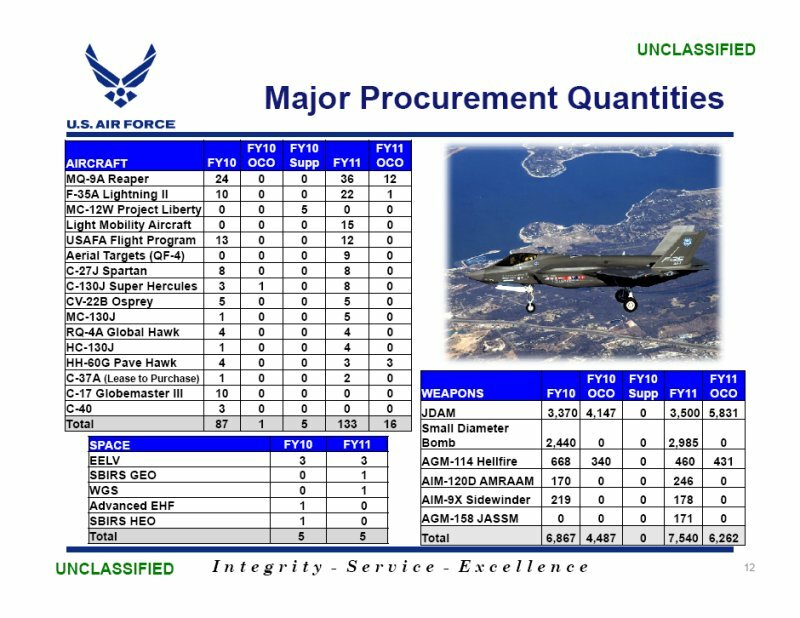 As you can see, a significant number of major procurement weapons systems -- 69 percent in FY '11 -- including baseline and overseas contingency operations, are focused on the demands of today; such as MQ-9 Reapers, RQ-4 Global Hawks, C-27s, Light Mobility Aircraft, CV-22s, C-130J Super Hercules, MC-130Js, HC- 130Js and HH-60 Pave Hawks. Additionally, we are preparing for future requirements, in that we are buying 22 F-35s, and have advanced procurement for continued buys. Lastly, we continue shutting down of the C-17 and the F-22 production lines, and transition to sustainment. This chart addresses both the FY '10 supplemental for increased Afghanistan ops and the FY '11 OCO request including as part of our FY '11 PB submission. Let me address FY '10 first. The FY '10 supplemental, which supports increased operations in Afghanistan -- you see that the MILPERS and O&M and the working capital fund, $4.7 billion, provides for paying allowances for 3,000 additional personnel. 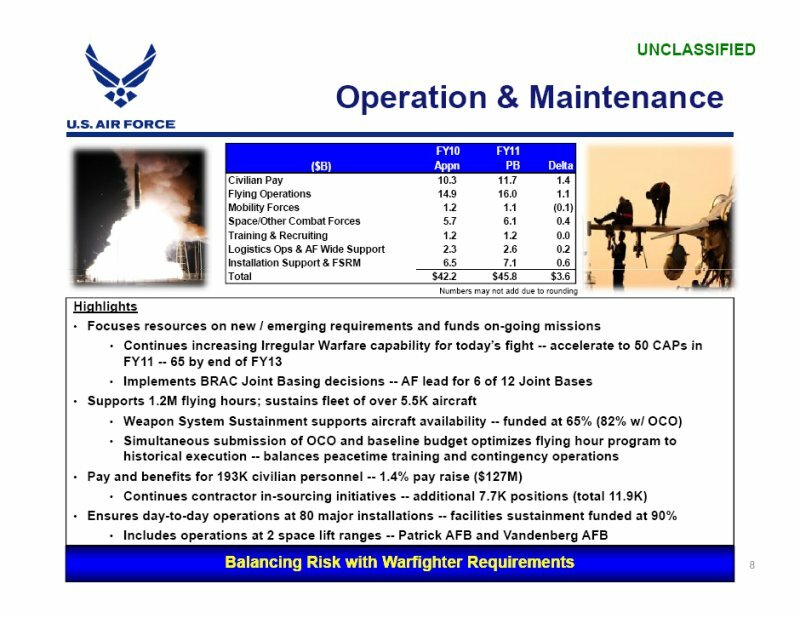 About $3.1 billion support ops, day-to-day ops, and $1.1 billion support baseline fuel increases. Then on the investment side, it funds 11 projects in Afghanistan, procures five MC-12s and supports F-15 and MQ-9 models. Now for the FY '11 piece: $15.4 million in MILPERS and O&M provides for paying allowances for 29,000 airmen, 398,000 flying hours, airlift sustainment, base support, airfield ops and delivers critical command and control, persistent ISR and firepower to U.S. and coalition forces. The investment -- $2.3 billion funds eight projects in Afghanistan, to include runway projects, aircraft shelters and cargo passenger handling terminals. We replace combat losses for 12 MQ-9s and one F-35 to replace an F-15 that was lost, and we buy three HH-60s in the overseas contingency operations budget. 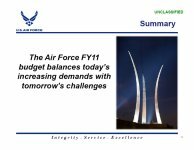 Bottom line on our FY '11 budget submission that we submitted today: The Air Force's FY '11 budget achieves the right balance between providing capabilities for today's commitments and posturing for future challenges. 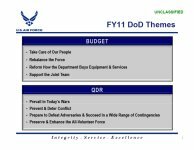 This request supports DOD budget themes and the strategic priorities specified in the 2010 QDR. It allows us to keep pace with capabilities that meet both short- and long-term threat demands while ensuring stewardship of national resources. And, finally, it ensures we take care of our most valuable national resources, our airmen and their families. Bottom line, the budget balances today's increasing demands with tomorrow's challenges. We will now entertain your questions. Q (Off mike) -- question on our "major procurement quantities" slide. I want to make sure I understand it. You list -- for the aircraft, you list 12 Reapers, three Pave Hawks and one F-35 that are -- that are being bought with OCO funds. Now, do those count in the total for FY '11 to the left? In other words, is it 36 Reapers total or 48? Q And why are those aircraft being bought with OCO funds? Why -- the Reapers, the Lightning and the Pave Hawk -- why are they funded from OCO? GEN. FLOWERS: Because they are replacements for aircraft that -- weapons that we lost in the war. And we lost an F-15 so we're not buying an F-15. We're replacing it with an F-35. And the Reapers are replacing Predators that were lost. MARILYN THOMAS: We do. We have funding starting in FY '12 for light attack. MS. THOMAS: $179 million (dollars). That's why you don't see the quantities in the '11. MS. THOMAS: $172 (million dollars), correction. Q General, can you talk about the new plans for the NPOESS weather satellite program? GEN. FLOWERS: The new plan as announced today breaks them apart. And there will be an Air Force piece and a NOAA program. We don't know what the specific programs will be. We don't have the details yet. But it breaks them apart. Q The funding line for NPOESS, that's up to date, that's accurate. GEN. FLOWERS: We have funding in the budget of over $400 million (dollars) for NPOESS. Q Frank Oliveri from Congressional Quarterly. You say that you lost an F-15 and you're replacing it with an F- 35. 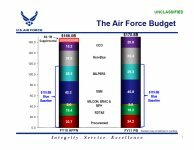 Can you talk about the disparity in the cost: how much an F-35 is going for in this budget versus what it would have cost to replace an F-15? MS. THOMAS: An F-35 is $141 million (dollars) roughly. Hard to say what the replacement cost of an F-15 would be, since we are currently procuring those. We'd have to go back and look at historical costs. I don't have that off the top of my head. GEN. FLOWERS: We do not have a total number. We can get a total number and provide it to you. Q Okay, that would be great. GEN. FLOWERS: I don't have one readily available right here. Q That would be great. And I'm also curious, there was some funding in an R&D line for a Space Protection Program. What does that buy you? MS. THOMAS: Do you know the name of the specific program? Q I think it was actually called the Space Protection -- (off mike) -- something very generic. GEN. FLOWERS: Let us get that back to you through -- (inaudible). STAFF: On the space budget --- (off mike) -- for space superiority they have $10.8 billion. Q Can you say what that includes? STAFF: GPS IIF -- (off mike) -- system -- (off mike) -- requirements with wideband global satellite, EELB (ph), Joint Space Operations Center, Operational Responsive Space. I think you would also have your -- (off mike) -- in that as well. MS. THOMAS: And let us reconfirm that, because I think what you're after is the old virtual MFP amount. MS. THOMAS: So let us just make sure that that is -- cross- checks with that, okay? GEN. FLOWERS: 149; we're buying -- (off mike). Q Right. Do you expect cuts in personnel costs to offset the costs of more aircraft? MS. THOMAS: No. There's no cuts in personnel in this budget. Really what you see is continued rebalancing that began last year, where we're focused heavily in our investment account on the current contingency operation and those assets required there. So we're buying more quantities, but of smaller, less-expensive aircraft, like MQ-9s. And the people that are required to man those and do the PED work -- the process, exploitation, dissemination -- are again part of the rebalancing that is going on within our military personnel account, where we are shifting people as we draw down some of our combat air forces and the end strength associated with that. And we are now re-gearing those towards some of these other missions. 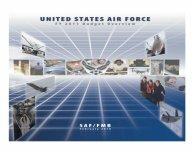 Q Has the Air Force paid for more aircraft by reducing end strength? How are you able to add aircraft and keep end strength at about 332,000? MS. THOMAS: Through rebalancing -- rebalancing internal to our appropriations to do that. And again, the increased quantities, in many cases, are for aircraft of lower unit cost than aircraft that we have bought in the past. GEN. FLOWERS: Yes, sir. Over here. Q Yes, sir. I wanted to go back to the FY '10 OCO. Can I get a little more detail as far as the 1 billion (dollars) set aside for funding ISR task force requirements? And another question: As far as the ISR analytical capabilities, is that strictly just a personnel investment that the service is making, or is there sort of a complementary investment on the procurement or R&D side to sort of support that analytical side to -- where the 65 (caps want to get there ?)? MS. THOMAS: It -- I think there's a combination of both. I mean, currently it's predominantly personnel in terms of supporting the PED mission -- processing, exportation and dissemination. But there is effort under way as well to automate to the extent we can to assist in that PED effort. I can't give you specifics off the top of my head, but there -- (audio break) -- a lot of work and effort going on in that area to automate as much as possible. Q And on the -- sorry. 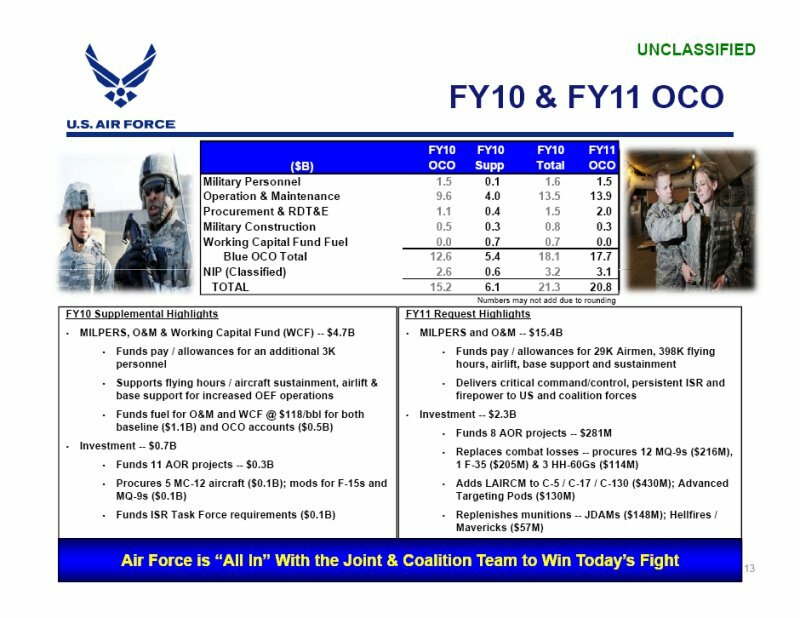 And on the task force -- ISR task force initiatives in the FY '10 OCO, there's 1 billion (dollars). (Off mike) -- any more detail on that? 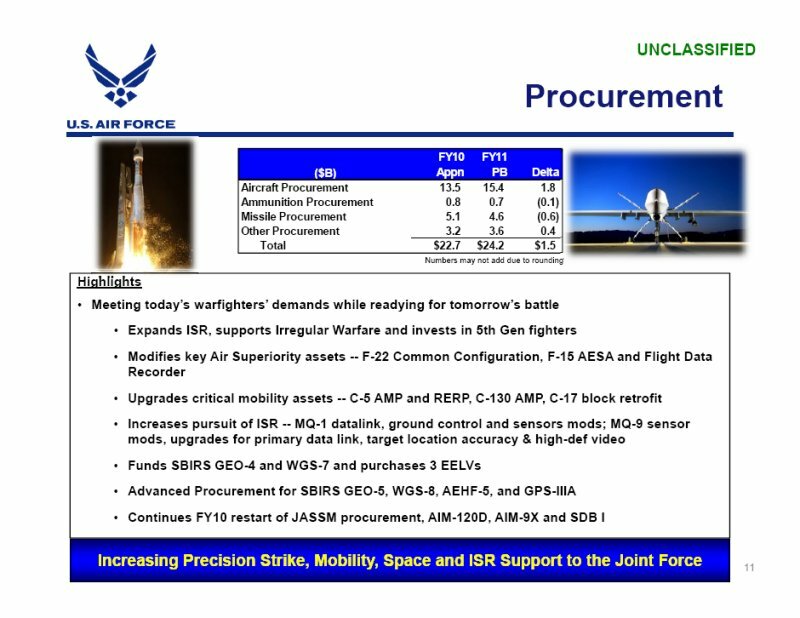 MS. THOMAS: A lot of that is the ongoing procurement, continued procurement, of ISR assets. And much of that is in the procurement chart before the -- the OCO chart. Okay. Q Could you walk through some tanker figures in terms of how many you're going to buy annually through 2015? And could you give us the profile -- the combined research and procurement profile between 2015 -- or 2012 and 2015? GEN. FLOWERS: How many we're going to buy in the FYDP? MS. THOMAS: -- I don't have each number off the top of my head. We do know that the program of record for the KCX is 179. I can't give you the quantity breakdown yet by fiscal year. We won't know that until we have a contract. So if you need further information of how we have laid out the FYDP funding-wise, we can provide that, okay? GEN. FLOWERS: We'll provide that to you. GEN. FLOWERS: No, in '11, Cyber Command will be stood up. That's -- primarily considers -- includes day-to-day operations after it's stood up in '10, at the continuation and day-to-day operations of Cyber Command. 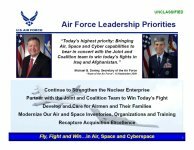 Q And are there various other cyber programs within the Air Force that you're funding? And how much would those cost? GEN. FLOWERS: There is the 24th Air Force, which is the numbered Air Force for Cyber Command that -- that's headquartered at Lackland Air Force Base. And that's the numbered Air Force that supports Cyber Command. Q Now that the RQ-170 is acknowledged, can you give us any funding numbers associated with the program? MS. THOMAS: No. That information is in a classified program. Q Tam Mehuron with Air Force magazine. 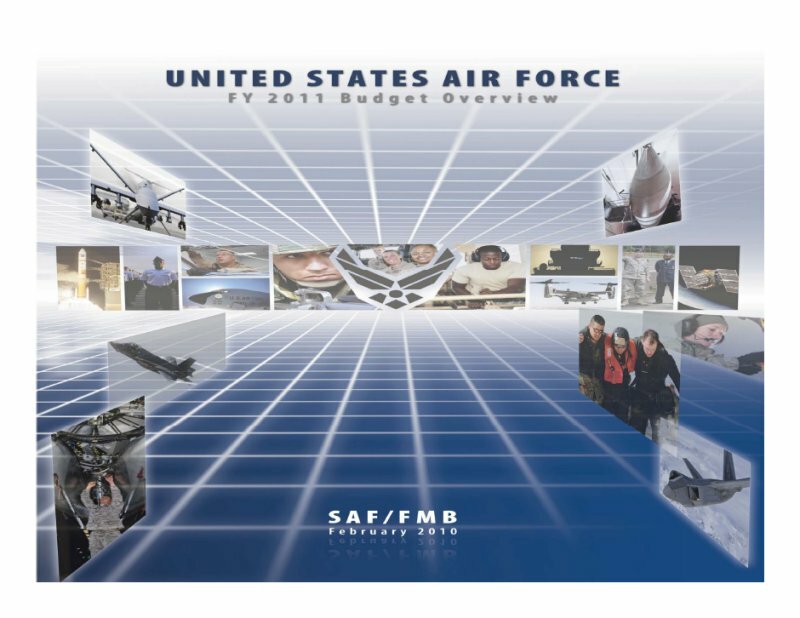 Could you please tell me how many numbers of E-8s are going to be re-engined in the FY '11 budget? GEN. FLOWERS: Of Joint STARS? GEN. FLOWERS: We buy two shipsets in FY '11, is what's funded. GEN. FLOWERS: Two shipsets, which would be eight engines. A shipset's four engines. Q Okay. Very good. Thank you. Q To go back to my procurement question, how much will the Reapers and the Pave Hawks cost? You gave a figure for the F-35. MS. THOMAS: The Reapers are about 11.4 a piece -- $11.4 million (dollars) a piece. The HH-60s are roughly $40 million (dollars) a piece. Q (Off mike) -- and engines? Q How much has -- how much has been dedicated for the long -- long-range strike program? GEN. FLOWERS: $200 million for technology exploration. 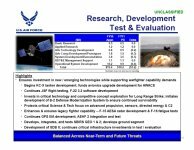 Q (Off mike) -- why the third-generation infrared program was terminated and whether the near-term hosted payload demonstration will continue? MS. THOMAS: The current demo is now part of the SBIRS program. The 3GIRS program, as we fondly call it, was terminated because the SBIRS program is performing well. The two HEO satellites are performing well. And for affordability purposes, we decided that it didn't make sense from a business case standpoint to keep both programs going. Q How much money is being dedicated this year for the officers' Critical Skills Retention Bonus? GEN. FLOWERS: The total for bonuses, retention bonuses, is about $664 million. But that doesn't just include officers. That's officer and enlisted. GEN. FLOWERS: Yes, sir. We'll provide you the breakout. Q Following up on that, what was the total number for bonuses for fiscal '10? GEN. FLOWERS: We'll have to get you the number for '10. Q And on a separate matter, I noticed, the total number of flight hours is expected to drop from 1.4 (million) to 1.2 million. Given that you have more aircraft, can you explain why? GEN. FLOWERS: The flying hours dropped. We -- they decreased by 162,000 hours. And what we've done is, we have optimized the flying- hour program now to reflect actually execution, in both baseline and OCO. We're submitting the budget -- the supplemental and the baseline budget at the same time. So it gave us the opportunity to really define what the flying- hour requirements were for OCO, what we were doing in the baseline. And the flying-hour program is fully funded, 1.2 million hours, in FY '11. And we've adjusted the program to reflect the actual execution, in both the baseline and what we're doing in contingency operations. Q Was there consideration to buy additional MC-12s in 2011 -- (off mike) -- Project Liberty? GEN. FLOWERS: We buy some in OCO. You're right, it's in '10. We buy five MC-12s in '10. Q But there was no consideration in '11. GEN. FLOWERS: There's -- we don't buy any in the budget in '11, no. Q Was there any money put aside for air-launched hit-to-kill, the anti-ballistic missile defense system? MS. THOMAS: I'm sorry, I didn't hear the question. Q It's an air-launched hit-to-kill. The chief ordered a study of that last year joint with MDA. And it's supposed to be basically an air-launched, like an AMRAAM, for hit-to-kill BMD. MS. THOMAS: Not that I'm aware of. GEN. FLOWERS: We'll have to get back to you on that question. We'll take that one. Q The 200 million you talk about for long-range strike, could you sort of detail for us a little bit of what that money's used for? It was mentioned earlier that some of that would be for stealth -- maintaining stealth, but I don't understand what that meant. And I'd like just a little explanation behind the 200 million. GEN. FLOWERS: It's technology -- maturing technologies and exploration for a long-range strike platform. MS. THOMAS: And it's primarily in the areas of LO sensors and net-ready COM (ph). Data links. 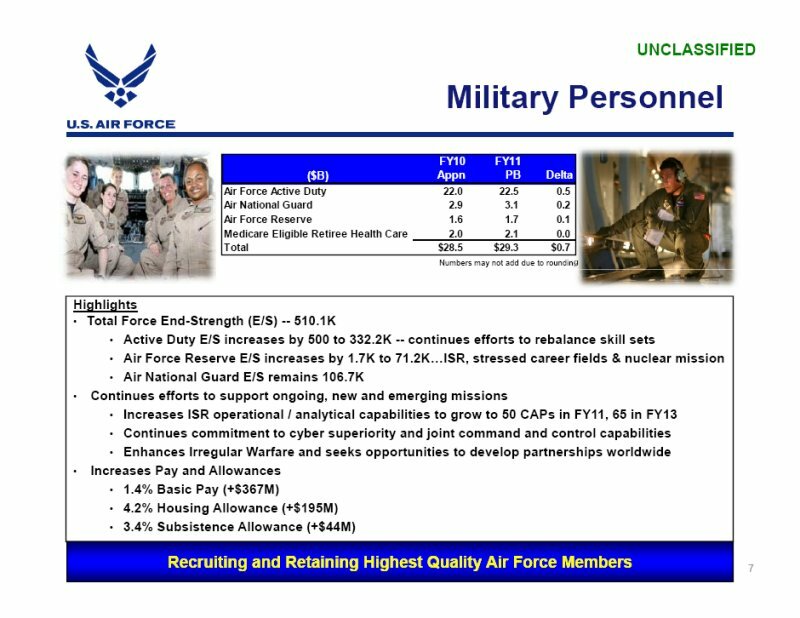 Q And this is all organic to the Air Force. It's the expertise within the Air force itself. It's not a contractor-based sort of thing; it’s just within the air Force. MS. THOMAS: There is a component of this that is contractor- based as well. I mean, there is an industrial base concern here that as we complete the study directed by the QDR to determine the family of systems to provide this capability, we needed to keep some industrial base viability so that once those decisions were made, we had the capability to move out. Q What form did that take, exactly? I mean, do you keep contracting with, like, you know Boeing and Lockheed to keep making designs for advanced (bombers ?)? MS. THOMAS: Well, I really can't get into the contracting specifics of it. Q Can you give broad detail about how you're maintaining the industrial base there? MS. THOMAS: Well, the capabilities themselves and the technology maturation, I mean, there is a valid requirement there, and the acquisition community will follow acquisition rules to pursue that. I can't get into the contracting specifics of it. Q Thank you. I saw in the budget that $6 million will be spent on reconstruction of military base in Kyrgyzstan, Manas military base. Does this necessarily mean that political problems regarding this airbase are already resolved? Because for a while there was some publication that Kyrgyzstan airbase may be removed -- (inaudible) -- replaced. GEN. FLOWERS: It's more of a policy issue, sir, than a budget issue. 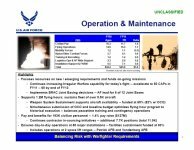 Q Is there a planned phaseout of the U-2 within the FYDP? GEN. FLOWERS: Yes, ma'am. The current plan for the U-2 phaseout is when the -- Block 30 of Global Hawk is IOC, which is planned for by the end of '13. Q Yeah, I had a question about the -- I see here the four air-support operations squadrons. I'm assuming those are the CRG groups, the contingency response groups. As far as the funding for those, can you break down how much -- how much that's going to work? Because from what I understand, there's one group in each COCOM. Can you kind of run that down as far as funding, manpower levels, that sort of thing? GEN. FLOWERS: Andy (sp), do we have that available? I don't know off the top of my head. STAFF: No, sir. We'll have to get the specifics on that question, sir. GEN. FLOWERS: Provide your question to Vince. We'll get you an answer to it. Your question is on the ASOS. GEN. FLOWERS: The U-2s will not go away until Block 30 of Global Hawk is fully IOC. Q Okay. So then that's when you begin the retirement? Q But it would be over a few years? MS. THOMAS: Well, we'd certainly have to evaluate it. MS. THOMAS: It's -- the two systems are interrelated in terms of Global Hawk's readiness to be operational. We're obviously not going to phase the U-2 out of there if it would leave gaps in capability. So we're continually reevaluating that, based on the performance of the Global Hawk Block 30. Q Do you have to defend your position to continue funding Global Hawk, in light of Secretary Gates' mention that programs that are having performance issues will get an extra eye? Because Global Hawk has been -- you know, sensors have been delayed, flight testing has been slow. MS. THOMAS: Well, part of the defense of a program that is struggling, as we all know, having observed the Nunn-McCurdy process, is whether or not it provides a critical capability to the warfighter that only that program can provide. And right now, in terms of a Block 30, the EO/IR sensor capability, we've really got the U-2 or the Global Hawk Block 30. And so based on the criticality of this in terms of meeting that need, I think there was consensus across the department we needed to press forward. STAFF: Folks, we can take about two more questions. Q Was there any funding for next-gen UAS? A follow-on to -- (off mike). Q Was there any funding for counter-UAS -- (off mike) -- applications in this budget -- counter-UAS? Q Was there any money for the next presidential aircraft? MS. THOMAS: There is money for a program office to start the acquisition strategy look and development -- I think $5 million (dollars). Is that right? 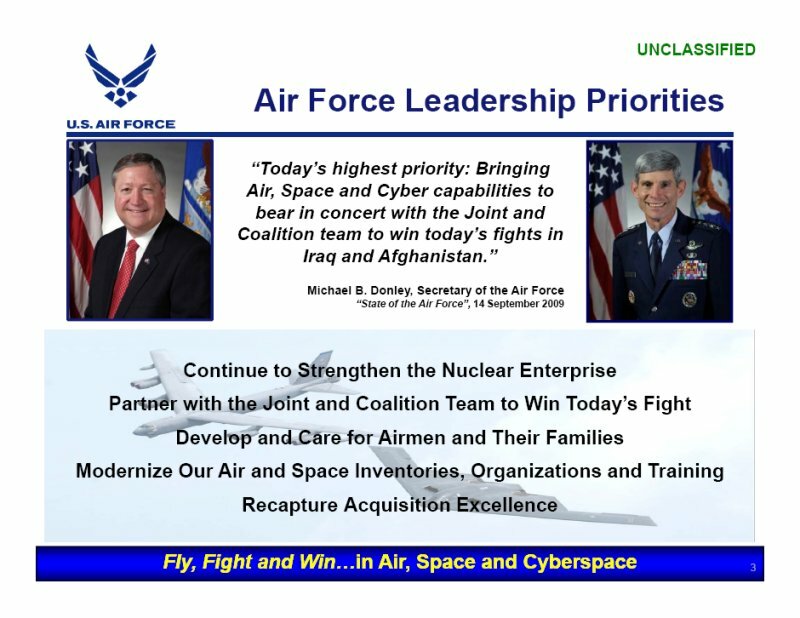 Q How much money went into -- will go in for FY '11 for the nuclear road map and some of those initiatives? GEN. FLOWERS: $5.8 million is funded in this budget for the nuclear enterprise; $5.8 billion -- I'm sorry -- $5.8 billion. Q (Off mike) -- for conventional -- (inaudible) -- strike sort of technologies in the R&D accounts? Do you have a number for that? Or is it still that hundred million with Navy, the joint program? GEN. FLOWERS: We'll have to take that. Q The QDR mentioned that the Navy and the Air Force are developing a new cruise missile -- strategic cruise missile. Is there money in your pot for that? GEN. FLOWERS: Just a minute. STAFF: $3.3 million in RDT&E. MS. THOMAS: What's the title? GEN. FLOWERS: $3.3 million in RDT&E. STAFF: It's called new cruise missile -- (off mike). Q Yeah. Is it a nuclear cruise missile, or a conventional? STAFF: It says stand-off capability critical to nuclear deterrence as -- (off mike) -- survivability concerns. Q It sounds like a nuclear one. STAFF: We'll find it for you. MS. THOMAS: Yeah, we'll probably need to clarify that for you. Q What's the per-unit cost for the Light Mobility Aircraft -- I'm sorry -- the advanced -- (off mike)? MS. THOMAS: They're $4.2 million (dollars) apiece. Q Are there any more details on what that really -- what the Light Mobility Aircraft is? MS. THOMAS: It's kind of what it says. It's a small aircraft, smaller than the C-27; probably six-passenger with crew. We're planning to procure 15 of them in '11. And again, it's going to be used in the building partner coalition role. MS. THOMAS: As passenger/cargo mobility. GEN. FLOWERS: Passenger and cargo. Q Is it similar to the C-12? Q So that's sounds like -- (off mike) -- during the fiscal year? MS. THOMAS: Yes. And the plan is to do something COTS/SCOTS (ph). So it should be a relatively quick and easy acquisition. Q And do you have a funding (tail ? ), how many years -- (off mike) -- procure? How many air frames? MS. THOMAS: That's it right now. Q Are those specifically for Afghanistan? MS. THOMAS: No, not specifically. Q Can you say who they're for? MS. THOMAS: I don't have the CONOPS for the plane yet. Can we get a follow-up on that? Q Okay. Does it have a name? GEN. FLOWERS: Light Mobility Aircraft. Q I mean like a code name, like KCX is for tankers. GEN. FLOWERS: Not that we're aware of. STAFF: Last question? All right, folks. Thanks for coming today. GEN. FLOWERS: Thank you very much.